Widely praised on its original hardback publication in 2006 and going on to win that year’s Costa Children’s Book award, Set in Stone remains one of the most impressive young adult novels of the recent past. Set mainly in 1898, its most remarkable achievement is in its complex and compelling narrative. This proceeds, at leisurely pace, from the moment when Samuel Godwin, a young artist, is engaged as tutor to Marianne and Juliana, daughters of Ernest Farrow, the wealthy owner of Fourwinds, a magnificent English country house. 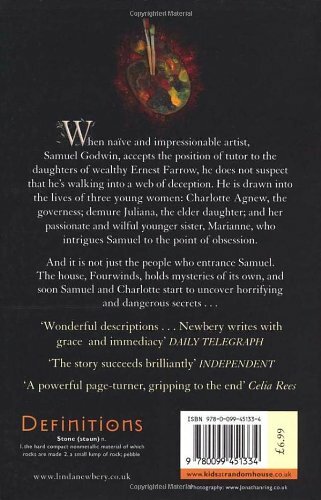 The beauty of the house and its grounds is lyrically evoked by Newbery and, from the outset, its charms beguile Samuel. But, as he is subsequently to discover, ‘beneath its immaculate surfaces, corruption lurked unchecked’. The delineation of this ‘corruption’ is handled with masterly skill, as we witness the reconstruction of a period and place dominated by passionate emotions, urges and yearnings, set against a vividly re-created world of art and architecture. Throughout, there are numerous thematic and stylistic echoes of Victorian fiction, together with equally numerous twists and turns of plot. It all adds up to a wonderfully clever and accomplished novel, one that can not be too warmly recommended.